Home > Shop By Brand > BLACKFIRE Pro Detailers Choice Car Care Products > BLACKFIRE Advanced Pad Conditioner 32 oz. Prime your pads for paint perfection! Dry buffing is what happens when a pad hasn't been primed. There is no lubrication between the pad and the paint to reduce friction. Even though there is polish on the pad, it takes several passes for the polish to completely cover the pad. In the meantime, you're dry buffing the paint! The result is fine scratches. Spray each fresh buffing pad with BLACKFIRE Advanced Pad Conditioner before using it. This friction can also tear or prematurely wear out pads, causing you to replace them much sooner. BLACKFIRE Advanced Pad Conditioner protects pads and paint. BLACKFIRE Advanced Pad Conditioner prevents dry buffing by moistening the pad face, what we call "priming the pad." It acts as a lubricant to eliminate the friction between the pad and the paint. In addition, BLACKFIRE Advanced Pad Conditioner opens up the foam's pores to accept the polish so it disperses evenly over the pad face. As soon as the pad touches the paint, it is already primed and ready to go! BLACKFIRE Advanced Pad Conditioner helps you reduce product waste, too. When your pad starts to dry out, mist it with the conditioner to re-wet and reactivate the product on the pad. BLACKFIRE Advanced Pad Conditioner will not interfere with the performance of any polish, car wax, or sealant. It will not react with any solvents or chemical cleaners found in any polish, and it will not dilute products if used as directed. Just like any lubricant, BLACKFIRE Advanced Pad Conditioner will gradually diminish as you polish. 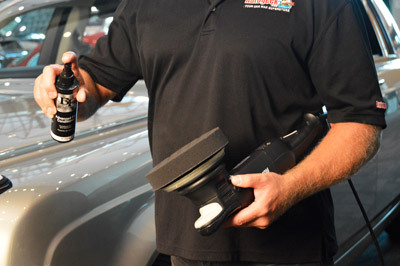 During buffing, BLACKFIRE Advanced Pad Conditioner removes stubborn films from the paint. Simply mist the paint and continue buffing to remove the film. BLACKFIRE Advanced Pad Conditioner is designed to prime all foam and wool pads. Before any other product touches your buffing pad, use BLACKFIRE Advanced Pad Conditioner first. Primes new pads for smoother product application. Prevents micro-marring caused by dry buffing. Re-moistens product to prevent drying on the pad. Protects pads by reducing friction. Removes stubborn films from paint during buffing. Before applying desired product to a foam or wool pad, mist the pad with Advanced Pad Conditioner. Proceed with normal product application. If the pad seems to "gum up," spray it again and continue buffing. If a product is difficult to buff off, mist the paint with Advanced Pad Conditioner and wipe the paint clean with a microfiber towel. Bye bye chatter and early pad wear! This product is great! A tiny bit goes a long way! What I like the most is while correcting paint, when the surface starts to get to dry, a little mist with this and everything gets creamy and goes back to cutting! ConsCost is high, should be a concentrate for this $ amount. I bought a DA polisher and pads to help take out the fine scratches in my clear coat. This was my first shot at machine polishing. This stuff, used sparingly, allowed the polish to spread evenly and work longer. It is like a lubricant for polishing which prevented drying of the pad. I also used it during the removal of the klasse sealant. It worked very well on those shots where I has excess, dry sealant. ProsIt just works. As a rookie I would not be without it. Good product for priming your pads before buffing.